Fleetwood Mac News: BIG Stevie Nicks Surprises Coming Next Week! Mysterious post on Liz Rosenberg's Instagram today... The caption below the photo in the post indicates there are surprises coming next week from Stevie (surprises as in multiple surprises)! In the photo she's obviously playing piano and playing solo - and it's in a studio setting with what looks like an audience. She likely taped something... but for what?? Hmmm... Guess we'll have to wait until more info is revealed. Exciting!! Fleetwood Mac kick off their 2015 tour next Friday in St. Paul, MN. "Next week is a BIG @stevienicksofficial week!!! Look out for surprises coming your way!" Maybe there are some more music videos coming? Maybe there's news about the Mac album? Maybe there's a big retrospective being released as Stevie has fulfilled her Reprise/WB solo contract? Perhaps there was a taped live show? My head is spinning with possibilities!!! Hopefully she's going on the road playing small venues after the Mac Tour!!!!!! Stevie has said she's committed to the current stint of Fleetwood Mac through the end of 2015. I don't think there are tour dates scheduled the last half of the year; they really need to take advantage of that fact and get Stevie in a studio later this year. I have a feeling once the tour is over she's going to want some time to do some solo stuff. Lindsey and Christine have said their contributions are mostly finished; most of the studio time could be spent on Stevie's contributions. Even if the band finishes an album by the end of the year their label won't release it until at least mid-2016. That would give Stevie plenty of time to do a small solo tour and perhaps release a few more songs. Maybe she'll do something from the new solo album on the FM tour? That's my guess and I think there is at least a chance. I read an interview with Mick Fleetwood that said they were hoping that Stevie would be able to join them in the studio after the tour. ?? I hate surprises!!! Still I think a new music video is in the works. Probably what she was doing in New York after the holidays. I'll be excited when it happens. Maybe she's singing Lady live - she is at a piano, after all. It looks like whatever the surprises are, they pertain to Stevie Nicks as a solo artist, otherwise wouldn't FM be promoting the surprises as being related to Fleetwood Mac? I am hoping for 24K-Part 2 to include Melacine/ Chanel, Chanel/ Night Gallery/ When Will We Love Again. And for a boxset retrospective picking up where Enchanted left off (not another grestest hits rehash with Stand back and Landslide since a boxset would most likely appeal to dedicated fans, and we already have those congs in spades). She could include the b-sides left off of Enchanted, outtakes like Joan of Arc, JiImmy Come On Back, & Baby Doll, demos for things she was unhappy with on FM albums like Smile at You, and soundtrack songs she recorded after Enchanted. If it does pertain to FM, I hope it is that they are recording a double album. "I Need to Know" are Tom Petty lyrics, but Stevie sings them very well! maybe she will be preforming at the grammys and is up for an award in feb. and she recording for the show.. Here's hoping whatever it is she is SOLO! !~ ENOUGH of the Mac experience!! Stevie is always fresh. Time for Christine and Mac to go away and stop bleeding Stevie's shine! I bet it will be a tour, although I much prefer reissues, 24K part 2, a boxset, a FM abum, or something else that's permanent. It's probably just some promo stuff that she filled in the mac's downtime. I mean, it's not like FM is retooling the setlist or anything before the next leg of the tour. It's just all downtime for her. Clearly it wasn't in the cards, but I wish she would have used those two weeks of this break to hit the studio hard with Lindsey and Chris. I love 24K Gold to pieces but the timing of that album and the Mac's nonstop touring since 2013 has been pretty horrendous! I wouldn't be surprised if in 2016 she says she's going to do a solo tour and not record with Fleetwood Mac. That would unfortunately put an end to their new album and give her back the power she seems happier with. And she may say that after that she may then record with them, but isn't sure yet. She may record more old demos instead. It is possible 2015 will be the end of Fleetwood Mac forever. !. Stop with the end of Fleetwood Mac stuff! Don't count them dead till their gone. 2. 24 Karat part 2 would be great with a tour. Stevie seems less stressed and much more personable when she isn't around the others. 3. Call a spade a spade. Fleetwood Mac has been on the road for 3 years. It did bring back Chris (happy dance) but they only have a digital EP show casing Buckingham from it. I don't think Stevie will leave Fleetwood Mac high and dry. There are no tour dates for the last half of 2015 (Stevie has said she's committed to Fleetwood Mac through the end of the year). I really think they will record with her later this year no matter what these surprises are. 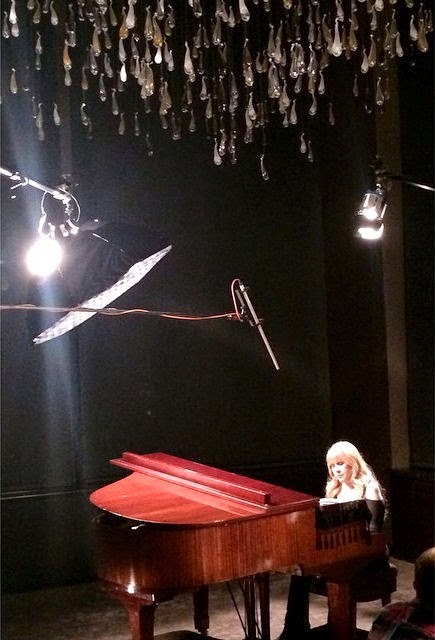 Stevie will give them one more album, especially now that she can record with Christine. Their songs are mostly finished the bulk of the studio time would be spent on Stevie's material, though she will probably insist on having Dave co-produce Stevie's contributions. The title of the article says "surprises" as in plural. What if we're finally getting Stevie's first few solo records remastered and re-released? Can't believe that anyone really thinks Stevie would let Fleetwood Mac end and not participate in one last album, especially with Christine back-not gonna happen! Also, don't see why it would have to be the end necessary unless they want it to be. They're fit, willing, and able! (The waiting is the hardest part) just threw out some of one of her best friends lyrics. Its next week already, and I can't wait I can't wait !!! I don't care what Stevie does as long as it is something SOLO!!! ENOUGH Fleetwood Mac... Having attended the Portland show, I felt there was a golden oldie feel that was not present when I was at last years show when it was just the 4 of them.. I was surprised...but though it was a good show, the great exciting fresh feel that Stevie and Lindsey brought was replaced with a feeling of re-run. Sorry. I also noticed that there was alot of beer runs whenever Christine took lead and about half the hall got up to leave when Song Bird started...Now if it had been Stevie singing it I think the crowd would have gone wild..